I’ve been collecting vinyl records for about 12 years now. That’s a lot of time spent flipping through bins, flipping over records, and flipping out whenever I find some ‘holy grail’ album I’ve long sought after. But one of the things I’ve grown to appreciate as of late is the packaging. 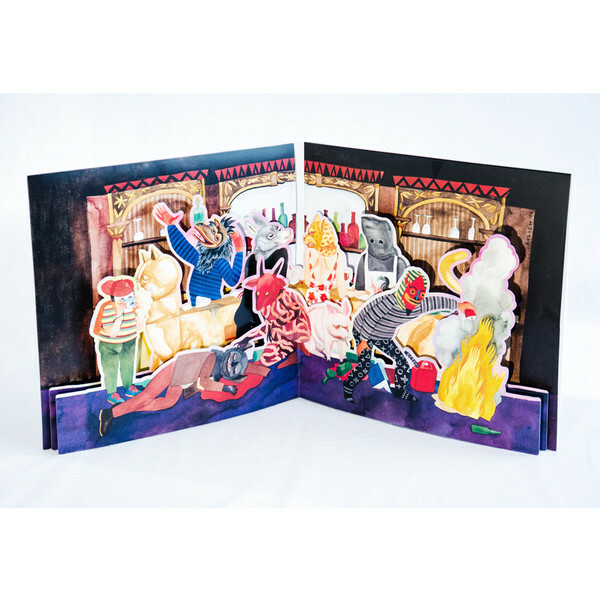 Whether it’s the metal zipper on Rolling Stones’ Sticky Fingers or this massive Father John Misty pop-up book record, it’s always a blast seeing how artists will present their work. Maybe it stems from spending so much time looking at and assessing what makes for good web design. In both realms, however, design is not the end point. Take that Father John Misty pop-up book. It looks incredible, but it actually was recalled for warping records. So, what’s my point (other than I spend too much money at record stores)? Good design doesn’t mean anything if your content isn’t there. I won’t spring for that deluxe pop-up book record if I can’t actually play the record. Just like I won’t spend time on a really cool looking website if I can’t engage with any decipherable content. The same goes for your social media accounts as well. And I don’t mean content for the sake of content, either. If you’re truly trying to move beyond the status quo, as is our motto here at, well, N2Q (No to the Quo), you have to step up your content game. Here’s why. We love SEO at N2Q. A lot. But optimizing your site for keywords doesn’t mean throwing jargon on a page that bait Google’s site crawlers. In fact, with the ever-changing algorithm and rules Google puts in place, that’s just going to hurt you in the long run. So, what’s a site owner to do? Invest in great content! Narrowing down keywords is a great way to lock in a direction you want to go in, but they’ll work best for you if you can place them in meaningful blog posts and page copy that your customers and site visitors will actually want to read. This also means trying to think of new ways of approaching a topic. Say you run an Italian restaurant. Instead of just posting mindless spaghetti copy every week, consider running a blog series on different ways of preparing pasta and highlighting how your own restaurant uses these techniques. You want to keep people hooked in as well. To belabor that vinyl metaphor a little more, if you hook someone in with the first single then you’re gonna want to follow up with another hit. Stay on top of mind of your audience by being active. Plus, more content means more chances for Google to crawl your site and get you seen. Be careful though, you don’t want to sacrifice quality for quantity. Find a method and frequency that’s easy replicated for your business. If it’s not feasible to post 7 days a week, choose 3 days for fresh new content and commit to that, each and every week. Google is great, but don’t rely on it solely for bringing traffic. If you’ve (hopefully) spent all this time working on great content, you should be putting in time to get it out there. This is a great way to bring in social media into the process. If you really want to go beyond the status quo, you’ll want to consider boosting your posts and running paid ads. No one likes taking out their wallet, but this is your best shot for getting eyes on your content. Blog posts are a great hook into the rest of your company. By investing in directing people to an article, you’re nudging them toward the rest of your website as well. They’ll be so inspired by your killer article comparing marketing tactics to record collecting, they’ll be drawn into the rest of your site as well (right?…RIGHT?!). Google loves influencers. By thinking high-level on your content strategy, you’ll be well on your way to becoming one as well. The right combination of quality articles, a prompt schedule, and investment into spreading your content across the internet will get you there. Need help along the way? N2Q’s SEO services put an emphasis on content and content marketing. We promise we’ll put down our records for a bit and get your site the great content it deserves. Give us a call today.